The architects were presented with a West facing stand with a large Stinkwood tree on the East boundary wall. 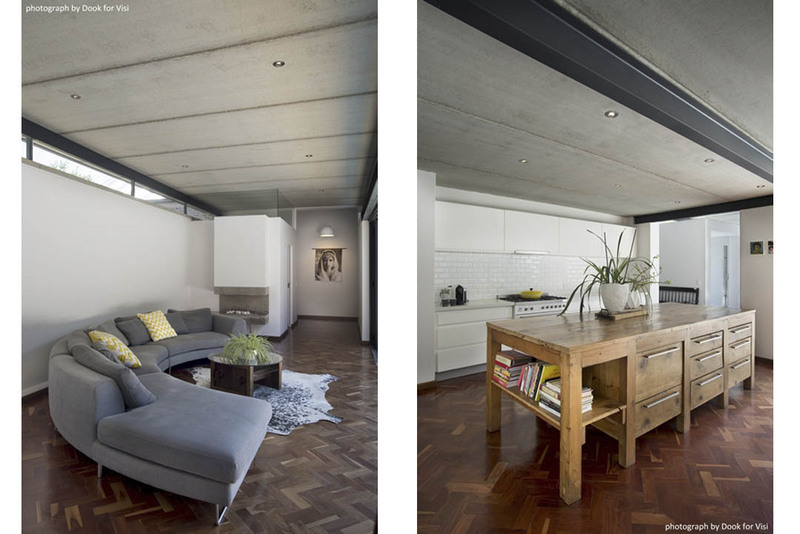 It was decided to create a ‘courtyard’ type house with a living ‘wing’ to the South, a bedroom ‘wing’ to the North & a ‘Link’ between the two, hence the name of the project. 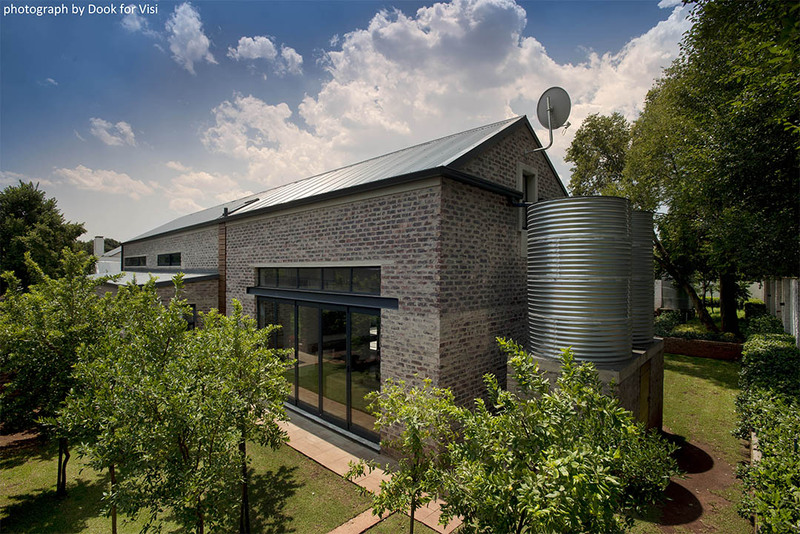 The ‘link’ creates privacy from the public street, block the Western sun & defines the courtyard. The Stinkwood tree act as main features to the courtyard. An ‘alternative’ to a float foundation was tried out with permission from the client, resulting in a cost & time saving as well as making it possible to insulate the floor which is not the case with a ‘traditional’ raft foundation. A solar water heating system is employed with natural gas back-up. 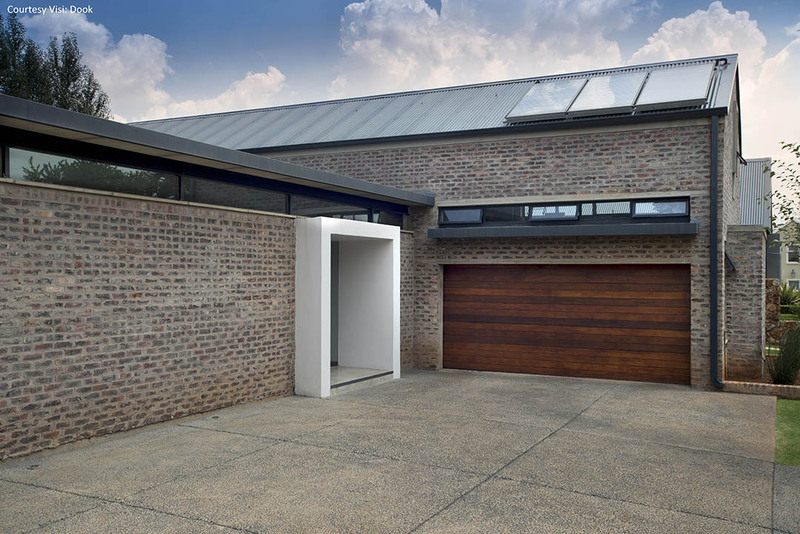 The house is properly thermally insulated by including Insulation between the two single brick skins of the outer walls, under the floor slab system, in the roof and double glazing to all external doors & windows. 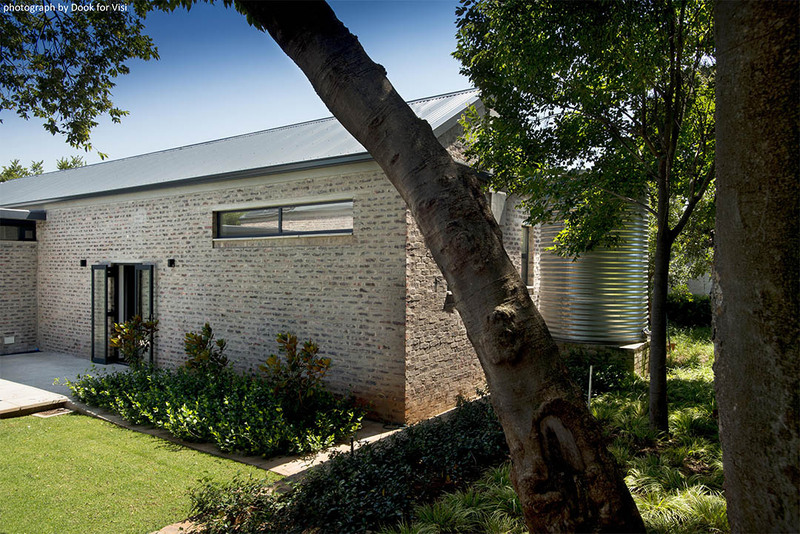 An age-old Wildberry tree takes center stage in the middle of a ~1200m² rectangular patches of land on this working dairy farm estate, creating some challenges as well as opportunities for us at Strey Architects. 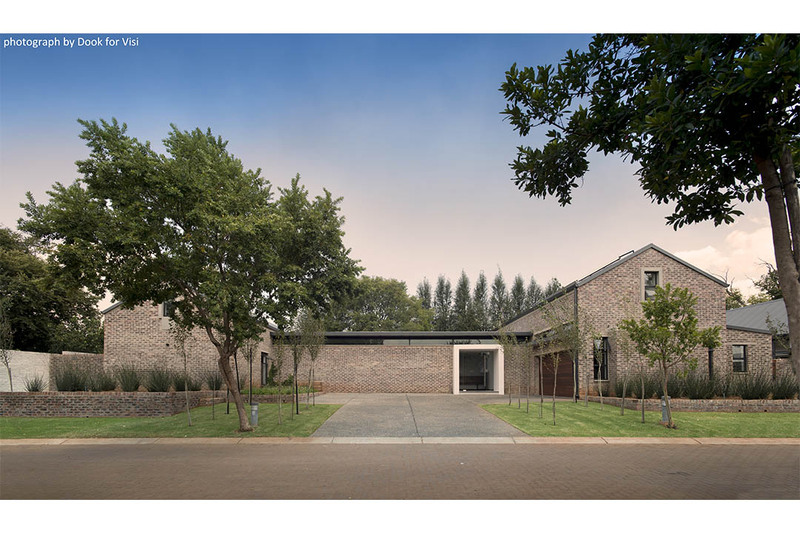 The shape of the stand, the position of the neighbours & the street & the local climate, lends itself to a courtyard-type dwelling, embracing the Wildberry and the ‘veld’ grass under its protective branches. 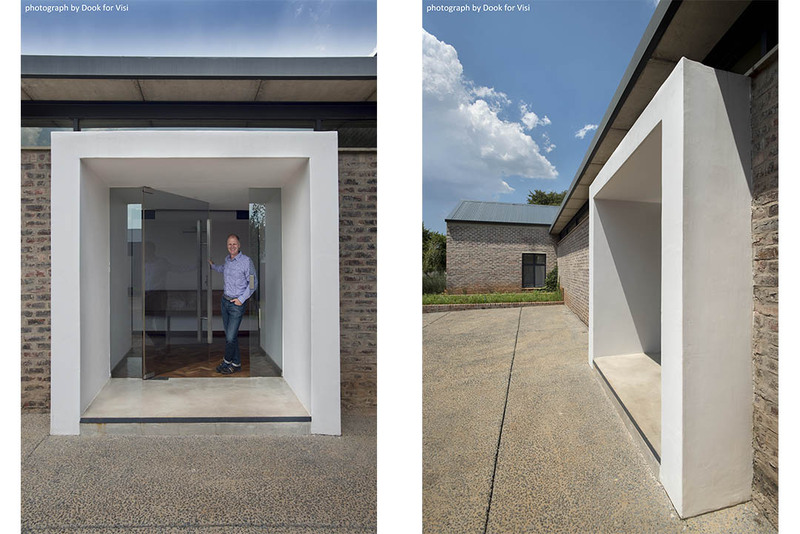 The house itself serves as ‘wall’ or ‘barrier’ (the link) between the public street & private courtyard behind. The ‘link’ divides the Southern living & guest wing from the Northern sleeping wing, as well as the street & vehicle circulation to the West & the pool, garden & outside entertainment areas to the East. 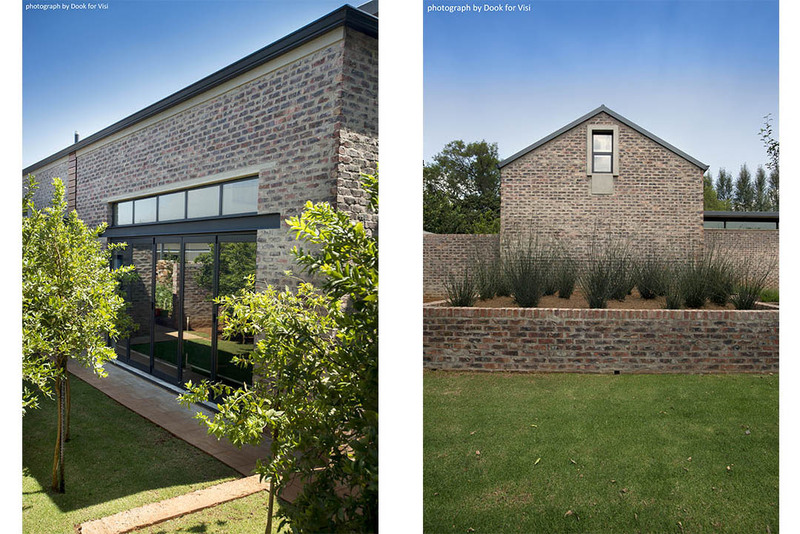 The courtyard house typology creates opportunities to have large expanses of North facing glass, (important for heat gain in the Southern Hemisphere), which allows the occupants to be washed with the warming sun, during the frosty Highveld winter months, and natural light filtering through to illuminate the bright interior. 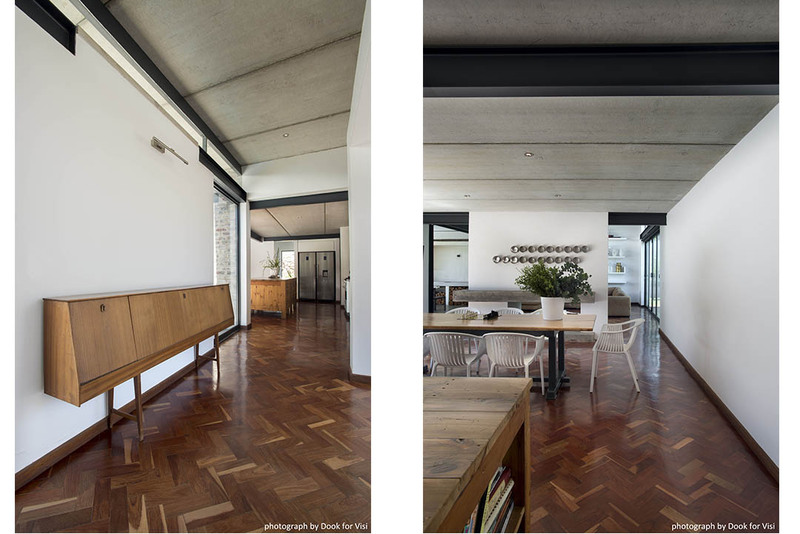 The southern ‘wing’ serves as the semi-private space where visitors can be entertained & guests can be put up for the night by this couple who loves to entertain & socialise with their friends & family. A large open-plan entertainment area with a massive kitchen island to sip wine while creating delicious African dishes, flows out through expanses of sliding-stacking glass doors onto a deck & lawn beyond, blurring the borders between inside & outside. 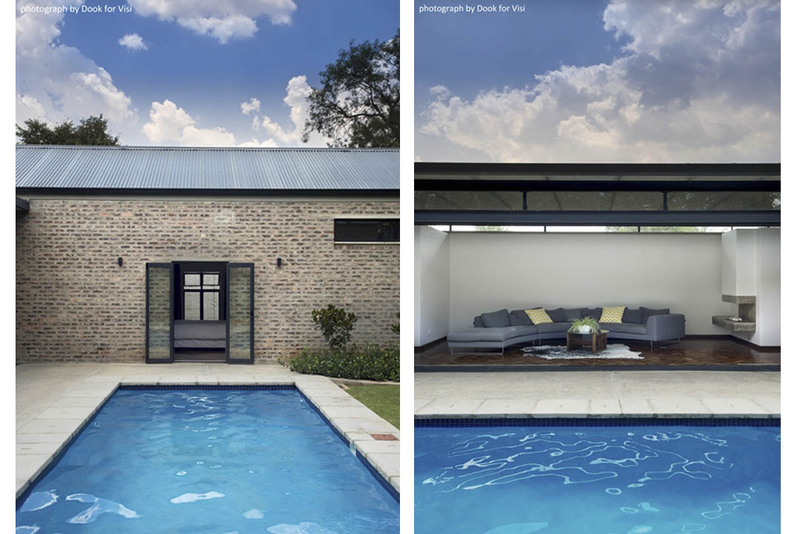 (The outside lounge concept is a vastly under utilised concept in South Africa, seeing that South Africans have some of the best weather in the world). Open white trusses and high Tongue & Groove ceilings accentuate the feeling of light & space, filtering the warm winter sun through celestial strip windows over large pergolas outside. The busy boys can be tucked away in the games room and pajama lounge above the double garage & kitchen, while guest have a special view from their Juliet-type balcony, situated in the double volume overlooking the lounge & entertainment areas with its welcoming open fireplace, deck, braai areas & swimming pool.. 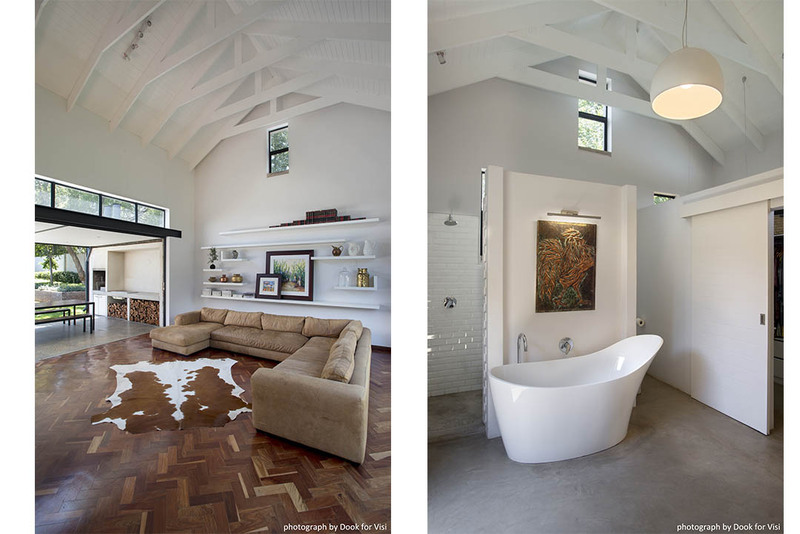 The north ‘wing’ serves as accommodations for two burly & busy little boys and their calm parents, with extra high ceiling reminiscent of the Victorian style farm houses found in the Old Transvaal around the turn of the 19th Century. The high ceiling allows for mezzanine type platforms to be installed in the boy’s rooms, which can be used for a bed, leaving the floor space open to build Skylectrix, train or Lego sets. The passage between the bedrooms is washed in southern light & affords panoramic views of the grassy courtyard & the entertainment areas beyond. The ‘link’ between the entertainment- & bedroom wings connects the public & private areas of the house, divides public & private space & triples as an entrance, gallery & study.